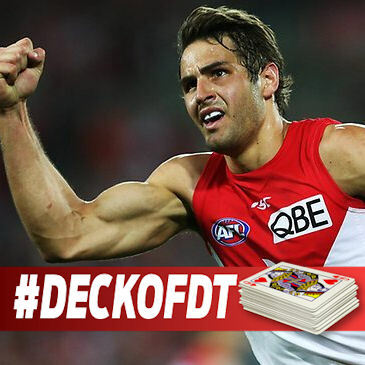 In the final Deck of DT for 2016, Warnie takes a bo-peep at our boy, JPK. We have a soft spot for old mate JPK at DT Talk. He was the first player we ever interviewed (well, with permission from the club and not just stalking dudes like Nathan Bock in our first year). Since we recorded that interview, he played 13 games for the Hawks before being traded to the Swans where his Fantasy game started to develop. Not only did he get an opportunity but he played 22 games in his first year at Sydney and showed his worth as a midfielder from the get go. In his six seasons at his new club, he has missed just two games… that’s out of a possible 132. Kennedy ranked fifth last season for points scored, sitting behind Jack Steven, Scott Pendlebury, Dan Hannebery and Todd Goldstein for an average of 107.5 – the best return of his career. This squeezed him into the top eight on average come season end. This season I believe he will lock himself into the top 8 midfielders comfortably as he will easily drop a season average of 110+. In his last 11 games of 2016, JPK averaged 118.2. An amazing number with 95 being his lowest total and a handy four scores over 127, including 151 against the Power in round 14. The best set of numbers were those over the Fantasy finals where coaches who were on board were treated to 120, 127, 134 and 119 for the final four weeks. The 27-year-old’s great end of season run continued is the Swans’ two finals appearances, knocking up 141 against the Dockers and 130 on the Roos. If you’re a believer of end of season form being a reason for selection the following year, then JPK ticks that box as well as anyone else in the competition. Couple this with the fact he’s likely to play 22 games and his role/place in the team won’t change, he’s a safe pick and potentially has some upside. It’s always something that sits in my head about picking dudes who are coming off their best season. I am always looking for value and selecting someone who has only averaged over the premium midfield figure of 105 twice in his 10 year career worries me slightly, especially with the value available in the midfield this year. Structure is why we probably shouldn’t select Kennedy. There’s no doubting how good he is, and most likely will be again this year, but there will possibly be an opportunity to get him cheaper. He has a nice early fixture, but with that being said, why not load up with all of these value picks? It is an interesting discussion point. Calvin is looking at six starting premium midfielders and looking to go heavy on value down back and up forward. If you are keen on that, then someone like a Kennedy should be in your side. But is Calvin potentially missing out on some of the big movers that are MID only? There’s a bit more to see over the NAB Challenge, but it could be a little ballsy to go with JPK from the start if that spot is being filled with someone who could be making more cash for the long term. The massive end to last season was completely different to the start. While 96.8 average in the first 11 rounds is less than disastrous, you wouldn’t be too happy if you’re paying close to $600K for a so-called premium dishing that up. He had a 67 against the Giants and 60 against the Suns in this period. JPK’s return games were 127 and 119, so don’t read too much into this as opponents, however he is capable of some ordinary scores in there. ACE – With only 5% ownership, Kennedy could be a pretty safe POD for your squad. Durable and will be in the mix to be one of the top averaging/scoring players come the end of the season. He finished fifth in the 2014 Brownlow and fourth last season, this year I think we might see JPK at his best and it will be nice to be on from the start. An tasty early fixture for the Swans sees them take on Collingwood, Carlton, GWS and Adelaide. This is enough to make him worth starting with, rather than an upgrade target. What will JPK average in 2016? That’s it for the Deck of DT for 2016! Thanks for jumping on the site everyday, voting in polls and joining in the conversation. It has been a great pre-season so far but with the NAB Challenge starting on Thursday, we have only scratched the surface on the #1 AFL Fantasy site on the net. Thanks Warnie for all the work you have put in through out this preseason, As for JPK theres a good chance i will start with him. Love a unique and I believe he will average somewhere around 111. It is a sad day… I’m sure we will be talking about him in round six. Cheers Warnie. As you said, probably the only reason people shouldn’t be selecting him in their team is because of structure. I originally had him in my team, but as quoted before, “didn’t fit my structure.” I totally agree that he will give the 110+ a real shot. Thanks for the DODT Warnie! It’s been great mate. Great article Warnie, I rate JPK has the best swan mid in terms of fantasy, however question is whether you start him or view him as an upgrade target if he starts off slow again this year. Cheers Warnie, fantastic article! DoDT 2016 has been great this year. Had JPK in my team but he “didn’t fit my structure”. Will hit 110 I believe. Upgrade target? Had him the second half of last year and wasn’t disappointed. Going into the season with one of the Sydney mids just can’t settle on one. JPK and Titch are leading at the moment. Mate, can’t wait for Thursday night…think the Fantasy podcast is a brilliant idea. Just curious will it be a downloadable podcast? Have training Thursday night and don’t want to miss the commentary. Want to be able to listen as I watch the replay. Cheers, keep up the good work boys! We are hoping we can get the audio to post on soundcloud, but not holding our breath! There was some talk about it being available on Friday dubbed over the game footage – if so, that would be sweet! Thanks for the reply mate! Really don’t want to miss out, sounds like some good listening. Should be in the top 4-5 mids which is what you want. What are people’s top 8 mids? Very good read Warnie. The argues for and against just about cancel each other out although I am looking at value in my initial squad and will therefore be looking at JPK as an upgrade. Interesting to note your comment re Calvin. I don’t disagree with the theory however I would lean towards the other way and top up in backs and forwards and use the cashcow options in the middle where there is so many more of them.